Going to the doctor and being prescribed a trip to the App Store might seem surprising. But in 2016, the NHS created a beta site which detailed a group of apps it was endorsing or was actively involved in creating. Here we’ll look at some of the useful apps that might ease the ageing process, rather than just something with which to keep your thumbs occupied while you wait for the bus. Some of these apps are only available on iOS, others are also available on Android and Microsoft devices. Once you enter the name of the pill, how many to take and when, the app will remind you to take the right pills at the right time with any relevant guidance. 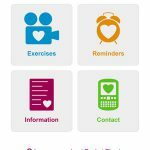 Care UK’s Pocket Physio app is a quick guide to the most important physiotherapy exercises to help you recover from hip or knee replacement surgery, as well as foot and hand surgery. However, this isn’t a substitute for your weekly yoga, pilates and that great masseuse you go to, obviously. If your ability to communicate is hampered by Dementia, Stroke, brain damage or just general ageing, then the Communication Tool created by Social Care Alba is designed to bridge that gap. There’s around 500 images to choose from to help communicate emotions, needs and opinions. Rally Round is a free online tool that allows family members, friends and carers to organise support for someone they care about. If you want to know who’s going to do Dad’s weekly shop, a few taps will allow to keep up to date. This is a walking app with the goal of motivating you to take a brisk 10-minute walk every day. Co-created by the NHS, you can choose your goal and track your progress through in a simple and easy-to-use way. With this app, there’s no shortcuts and definitely no sneaky half-way mark naps. This allows you to find people with similar health conditions, so you can connect with people going through a similar thing. The app’s got over 700 communities built around shared experiences of lung cancer, fibromyalgia and leukaemia, to name a few. The communities are moderated by reliable patient organisations or charities to ensure the best information is being shared by everyone.